Having missed Mieczyslaw Weinberg’s The Passenger at ENO in 2011 and only seeing David Pountney’s much-travelled premiere production on film (via YouTube) this week, this was my first proper encounter with the opera. Its story is now reasonably well known, but a quick resumé: Weinberg’s composed his opera based on Zofia Posmysz’s semi-autobriographical novel of experiences at Auschwitz in the mid-60s. But its subject matter was too strong even for the Soviets, and it didn’t see the light of day on stage until Pountney mounted it at Bregenz in 2010, since when it has been seen in the UK, the US and further afield. It had its German premiere at Karlsruhe in 2013 and, thanks to Gelsenkirchen’s new production it is swiftly on the way to becoming a repertoire work. 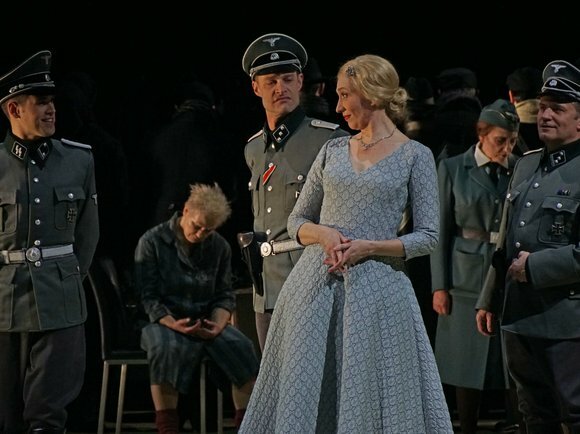 The opera’s plot – about Lisa, a former SS officer at Auschwitz’s supposed re-encounter with one of her charges in her new post-war life – is suffused with the ideas of memory and remembrance and these are brought to the fore in Gabriele Rech’s perceptive production at the Musiktheater im Revier. Rather than the split-level set called for in the libretto – 1960s ocean liner above 1940s prison camp – she and Dirk Becker have set the whole work on board the luxury ship on its way from Europe to Brazil. Thus the implication is that Lisa’s sighting on the voyage of the former inmate Marta – whom she presumed to be dead – ignites all her memories of her time at the death camp, and we see everything through her eyes. We never quite know if it is Marta, anyway, or just a lookalike who sets off Lisa’s reminiscences as she first admits her shady past to her diplomat husband, Walter, and then goes on to seek to come to terms with it by reliving her experiences. Arguably this approach sanitises the Auschwitz scenes, since it doesn’t give a sense of the environs, bit it puts the onus on the characterisation to convey something of the conditions. This the Gelsenkirchen cast did impressively. From the looks on the faces of the singers at the subdued final curtain calls this was obviously a draining experience for them all. Ilia Papandreou was an intense, keening Marta, a character wanting to be equal with everyone but through no choice of her own picked out by Lisa for special treatment along the lines of divide and rule. And Hanna Dóra Sturludóttir’s Lisa got to grips with a woman trying to reconcile her past in her attempts to argue that she was only doing what everyone did at the time, and that she was one of the ‘good ones’ in her treatment of the prisoners. As her husband, Kor-Jan Dusseljee sang with clarity and finesse, and Piotr Prochera’s Tadeusz – Marta’s lover – impressed not only for his eloquent singing but also for playing on the violin – creditably – the opening of the Bach D minor Chaconne that sets his fate. The distinction of the smaller roles did credit to the theatre’s ensemble – more so, as it happened, than in the subsidiary roles of the following night’s Tristan premiere (review forthcoming in The Wagner Journal). The chorus sang with force and the brass-and-percussion-dominated orchestra played incisively under Valterri Rauhalammi. But we are left with the issue of the music itself. However much one can believe the sincerity of Weinberg’s utterances, there’s no getting away from the fact that he lacked a truly personal voice – so much of the score, as elsewhere in his output, comes across as sub-Shostakovichian. The score of The Passenger certainly hangs together, and its ideas are often striking, but there are just too many echoes, unabsorbed, from Lady Macbeth of Mtsensk and its final gulag march scene in particular.